All Pear Deck files are saved automatically in Google Drive, where you have unlimited storage. You can see exactly who joins your Sessions in real time. You can automatically generate student notes documents called Takeaways™ in Google Docs™ or export student responses to Google Spreadsheets™. You can invite students to join your presentation through Google Classroom and post the link to their Takeaways to your Classroom feed. 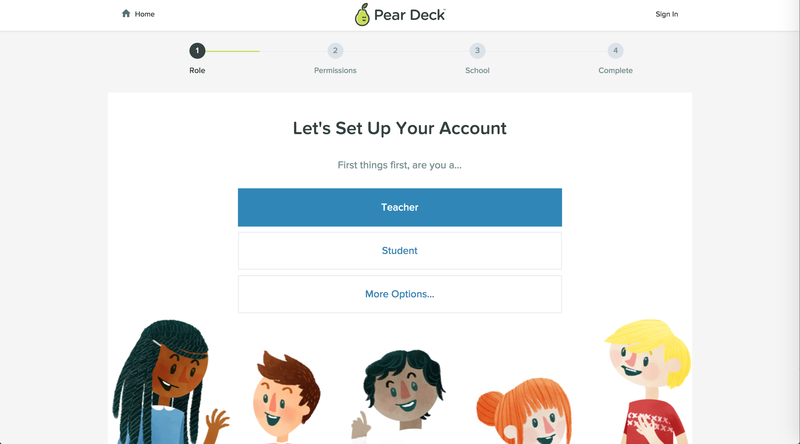 There's no additional password to remember for Pear Deck. Pear Deck is perfect for schools that use Google Apps for Education! Starting out on your own? Sign up for a free Google account. 1. 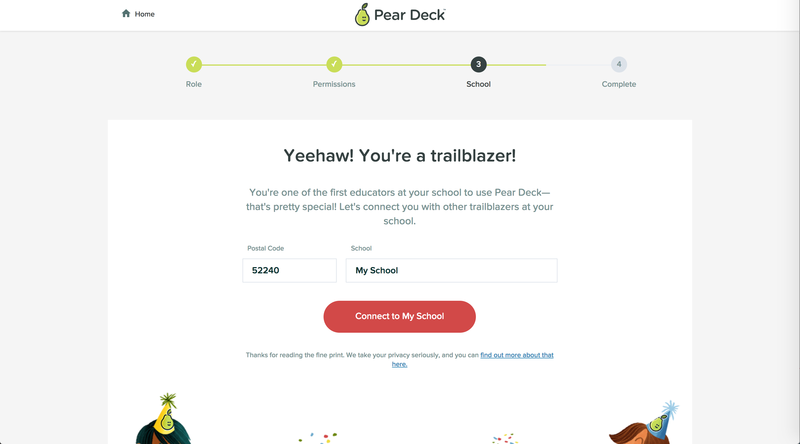 Go to peardeck.com and click For Teachers. 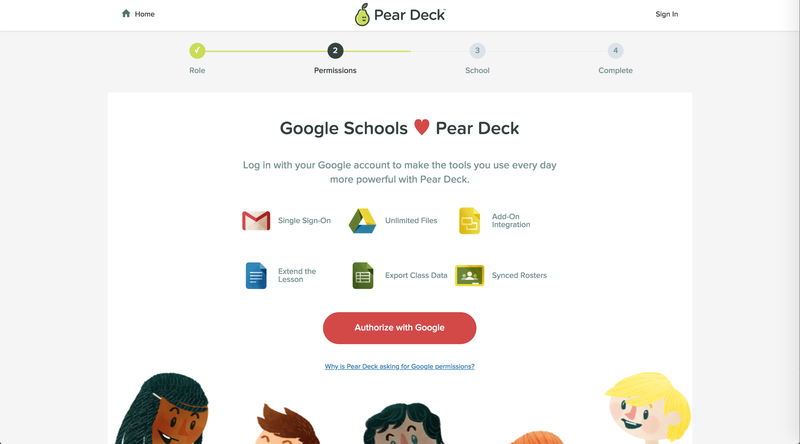 Click Authorize with Google to connect Pear Deck to Google Drive. You'll be prompted to sign in with your Google email and password and you will be asked to grant Pear Deck permissions in your Google Drive. Enter your postal code and school. You're all set! Click Get Started to get into Google Slides and start a new presentation with interactive questions. 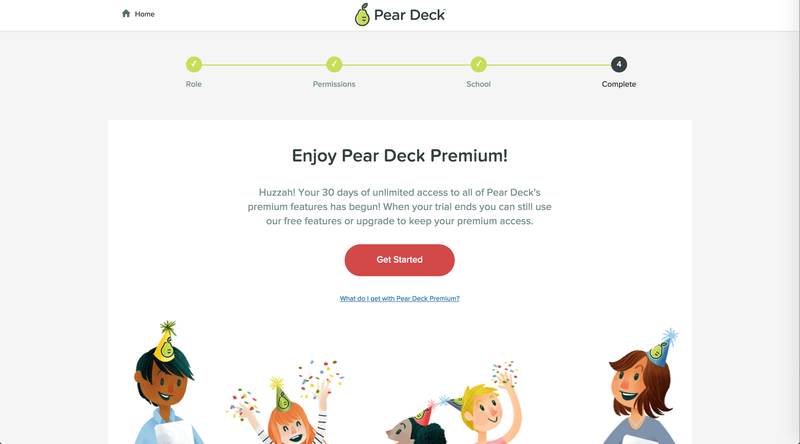 Your free 30-day trial of Pear Deck Premium will begin automatically! 1. Open any Google Slides presentation. 2. Get the Pear Deck Add-on. Find Pear Deck. Click the Free button to install this Add-on. Because Pear Deck files are stored in your Google Drive, we ask for third-party app permissions to access your Google account. We only access the files you ask us to when you use the app. For example, when you want to make a Google Slides file interactive, we access that file so we can add the interactive questions to it. To learn more about or approach to data privacy, please see the Pear Deck Commitment to Privacy. Now that you've installed the Pear Deck Add-on, you can go back and open it at any time from the same Add-ons menu. After you've answered the account setup questions, you'll be on your way! *We do not collect student data. Anyone who chooses the role of Student in the setup process will either be directed to joinpd.com to join a presentation, or allowed to create their own presentation without answering any further identifying questions.